2017 was an exciting year for Emerging Professionals in Detroit. With a fresh energy brought to the Emerging Professionals Committee, our membership brought new events, conversations, and exciting momentum to our professional community. In September 2017, the inaugural AIAD CKLDP Cohort of 16 scholars, along with the program’s leadership team, gathered for a ‘Bootcamp’ kick-off to the program. With the support of AIA Detroit Chapter leadership and the dedicated energy of our own committee members, The Christopher Kelley Leadership Development Program (CKLDP) was launched in September 2017, providing a new opportunity for young professionals to hone their skills and prepare for future career advancement. The support and participation of our membership made for successful networking and professionally-oriented events, bringing us together to share and learn. The support of our sponsors allowed us to establish what will be a recurring showcase for the talents of our emerging membership through the Future Focus Emerging Designer Spotlight. The priorities outlined in our mission statement to engage, listen, and lead compelled us to volunteer our time and efforts to benefit the city of Detroit itself. With 2018 well upon us, the committee is excited about where we are headed next. The EPC’s 2018 programming kicked off with a community design charrette for the North End neighborhood, in partnership with the Urban Priorities Committee. 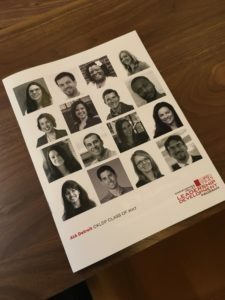 As many emerging professionals prepare for the Architecture Registration Exams, the EPC has partnered with AIA Michigan to develop an initiative to support and encourage candidates in Detroit and across the state throughout 2018.